Gulmarg, March 02 – The Chief Minister, Mr. Omar Abdullah today declared open the three-day 2nd Annual Gulmarg Global Derby organized by the Tourism department at this famous Ski resort amid fanfare. The Winter Games Federation of India has approved this event and is being sponsored by Aegis-Essar Group. The event is being supported by Pine Palace resort. It is for the first time that a renowned multinational company has come forward to sponsor such an event. New-Delhi March 02 – The 8-day “Jammu Kashmir Festival” concluded here with the presentation of a multi-cultural gala show of music and dance depicting diverse cultural mosaic of all the regions and sub-regions of the state. The mega event was organized for the first time in the Union Captial by State Cultural Academy in collaboration with Indira Ghandi National Centre for Arts (IGNCA) in an effort to package composite culture of the state. The technical support for the purpose has been provided by High Altitude Warfare School, Winter Games Association of J&K, Youth Services and Sports department, Institute of Skiing and Mountaineering, University of Kashmir besides Cable Car Corporation. 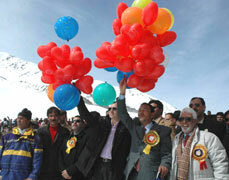 The highlight of the event is free ski run (Derby) from Mount Apharwat to Gulmarg. Twenty nine participants from countries like USA, France, UK, Switzerland, Russia, Bulgaria, Italy, Australia and Canada are taking part in the event. The occasion has generated lot of interest among the local ski enthusiast and 25 best qualified skiers and snow boarders have been selected to participate in the derby. This year, apart from free ski run, alpine and cross country races will also be held to broaden the spectrum of the event. New-Delhi March 2 – The 8-day “Jammu Kashmir Festival” concluded here with the presentation of a multi-cultural gala show of music and dance depicting diverse cultural mosaic of all the regions and sub-regions of the state. About 50 artists from Jammu, Kashmir and Ladakh participated in the concluding show that enthralled a galaxy of dignitaries including intellectuals, artists, painters and craftsmen besides commoners. Addressing at the concluding function Secretary Cultural Academy Mr Zafar Iqbal Manhas said that more than 500 artists from all parts of the State participated in the historic mega cultural event. He expressed satisfaction at the massive response of the people including foreign nationals that turned up in large numbers to witness the festivities aimed at showcasing centuries old traditions, cultural ethos, heritage, crafts and cuisine in the capital. He said the Academy is planning to hold another big event in collaboration with IGNCA in Kashmir during summer. Meanwhile, the two- day national seminar on eco-cultural heritage of Kashmir also concluded today, 11 papers were read out by different scholars including presentation on Ladakhi culture by Nawang Tsering and Sonam Spalzin. Others who presented papers on the occasion include R L Bhat, Sunil Khosa (IMFA), A S Tripathi, S A M Rizvi, Prof. Kala and R L Bhat. Beside, during the marathon festival as many as 35 films were screened. In the concluding session alone four films on different topics were screened. A film directed by Shiv Dutt and written by K D Mani on Tribes of Perpanchal was highly appreciated by the film and art critics on the occasion.